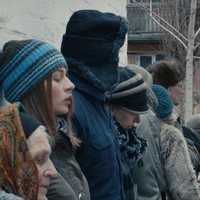 Donbass, by the belarusian filmmaker Sergei Loznitsa, returns to the most harrowing fiction after films like 'Austerlitz', 'The Last Empire' and 'The Bridges of Sarajevo'. We are facing a portrait downloaded from Ukraine and its society, focused on the political tensions that occur in the country. We are facing the era of post-truth and false news, where manipulation is in every day life and propaganda doesn't known ethical limits. A society that confuses peace with war, takes propaganda as truth and that calls love to hate. A life that borders on death. This is the reality presented to us by Sergei Loznitsa, who has been awarded at the European Film Festival in Seville and the Cannes Film Festival. Write your own 'Donbass' review.